Meanwhile in France, Bartholdi required the assistance of an engineer to address structural issues associated with designing such a colossal copper sculpture. Alexandre Gustave Eiffel (designer of the Eiffel Tower) was commissioned to design the massive iron pylon and secondary skeletal framework which allows the Statue's copper skin to move independently yet stand upright. Back in America, fund raising for the pedestal was going particularly slowly, so Joseph Pulitzer (noted for the Pulitzer Prize) opened up the editorial pages of his newspaper, "The World" to support the fund raising effort. Pulitzer used his newspaper to criticize both the rich who had failed to finance the pedestal construction and the middle class who were content to rely upon the wealthy to provide the funds. Pulitzer's campaign of harsh criticism was successful in motivating the people of America to donate. The story of the Statue of Liberty and her island has been one of change. The Statue was placed upon a granite pedestal inside the courtyard of the star-shaped walls of Fort Wood (which had been completed for the War of 1812.) The United States Lighthouse Board had responsibility for the operation of the Statue of Liberty until 1901. After 1901, the care and operation of the Statue was placed under the War Department. A Presidential Proclamation declared Fort Wood (and the Statue of Liberty within it) a National Monument on October 15th, 1924 and the monument's boundary was set at the outer edge of Fort Wood. In 1933, the care and administration of the National Monument was transferred to the National Park Service. 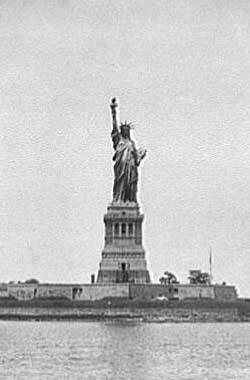 On September 7, 1937, jurisdiction was enlarged to encompass all of Bedloe's Island and in 1956, the island's name was changed to Liberty Island. On May 11, 1965, Ellis Island was also transferred to the National Park Service and became part of the Statue of Liberty National Monument. In May of 1982, President Ronald Reagan appointed Lee Iacocca to head up a private sector effort to restore the Statue of Liberty. Fundraising began for the $87 million restoration under a public/private partnership between the National Park Service and The Statue of Liberty-Ellis Island Foundation, Inc., to date the most successful public-private partnership in American history. In 1984, at the start of the Statue's restoration, the United Nations designated the Statue of Liberty as a World Heritage Site. On July 5, 1986 the newly restored Statue re-opened to the public during Liberty Weekend, which celebrated her centennial.